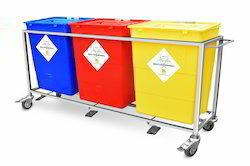 Leading Manufacturer of stainless steel waste segregation trolleys, bio medical waste segregation trolley, color coded waste segregation system, hospital waste segregation trolley, mild steel waste segregation trolleys and waste segregation bins from New Delhi. 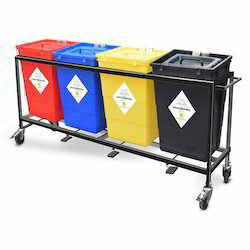 We are engaged in bringing forth a comprehensive assortment of Stainless Steel Waste Segregation Trolleys that is precisely manufactured and has perfect finish. The offered products are highly acclaimed in the market for their durability and weather resistant nature. Manufactured under innovative workers with superior grade raw material and sophisticated machines, these are used in various Healthcare Facilities, industries, hospitals, private firms & many more places. Moreover, the products offered by us are available in various sizes, shapes & dimensions and can also be effectively customized as per client's specifications. Waste Segregation Trolley With Plastic Bin. Each Plastic Bin Capacity -15 Liter. Available in 1 ,2, 3,and 4 compartment. Compartment in the trolley attached to each other. 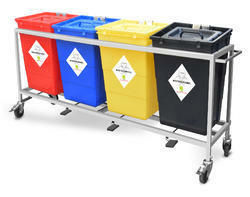 Waste Segregation Trolley with One,Two, Three and Four Compartment. Trolley Available In Stainless Steel and Mild Steel Powder Coated on castors. Foot operation system for touchless opening of lid. Bins can be interchanged as and when required. 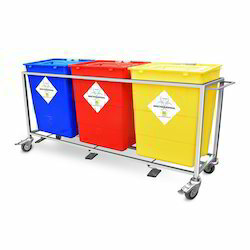 Autoclave-able and environment friendly, Reusable Plastic Bins as per BMW Colour Coding. Backed by talented & skilled professionals and rich industry-experience, we are able to offer a wide range of Waste Plastic Bins. 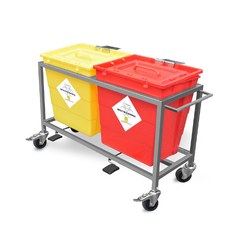 Our offered range is widely used in various residential, commercial and industrial sectors for carrying waste from one place to another. These products are rigorously checked against various parameters of quality to deliver the flawless range to our clients. The products offered by us are available in standard as well as customized specification as per the varied requirements of our clients. Foot operation system for opening lid. 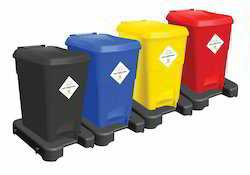 Autoclave- abel and enviroment friendly ,reusable plastic bins as per BMW color coding. 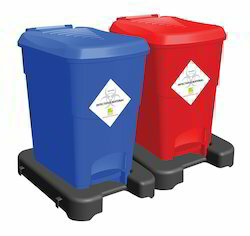 Available Bin sizes 30 and 60 liter. Color Coded Plastic Trolley . Plastic Bin with Foot Pedal. Capacity-15 liter of each bin. Available with 1,2 up to 4 compartment. Wheels and Handle Optional . 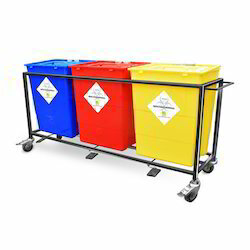 We offer a wide range of high quality of Waste Segregation Bins With MS Frame to our customers. 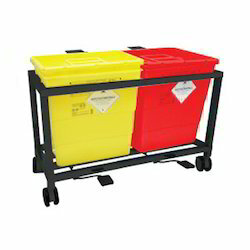 These containers find a wide range of applications in Hospital industries. Our containers are widely appreciated by our clients for their unique features such as they are lightweight, durable, chemical-resistant and non-reactive in nature. Stainless Steel Trolley on Castors. One compartment waste segregation system having stainless Steel frame and trolley on castors. 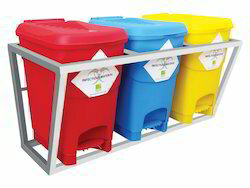 With foot operating system and one Autoclavable and Environment friendly, reusable plastic bins as per Bio Medical Waste colour coding. Plastic Bins Sizes are 30 and 60 liters. Available in One,Two,Three and Four Compartment.